I must say that in the nearly two years since first finding out about Berg Cloud’s Little Printer, the cheerful refrain of “Go, go, go, Little Printer” (to the tune of “Little Queenie”, a Chuck Berry original frequently covered by the likes of The Beatles and Rolling Stones), has been stuck in my head. That song’s positive, upbeat spirit just seems to go along perfectly with the trademark smiling face that has come to be associated with Little Printer, first during its pre-shipment publicity phase, and then in its two periods of production and shipment. As you can see from the following links, I’ve been watching this product for a while. So before going on to at least a few of the merits of Little Printer I have discovered, we should reflect, in the fine academic tradition, by conducting a “compare and contrast” on the two evaluation processes I’ve been involved with recently, and thus reflect more generally on early product testing as well as general peaks and valleys of being an early adopter. The table below shows some of the comparisons and contrasts I’ve come up with so far. Be invited by Google to be an Explorer, based on “application by tweet” (program now closed). Essentially a beta program but with free-form feedback requirements. Order online since it is a product in production. Pay $1,500, travel to Google Office (at additional expense) in San Francisco, Los Angeles or New York for pickup and training. Pay $249 for printer, bridge and extra paper. Ships via FedEx. Requires Google+ and Gmail account. Yes – for data access via Bluetooth tethering. Yes – for remote control. Has features of a smartphone. Its heads-up, hands-off ability for image/video capture is its most immediate selling point. Might think of it as an overgrown Bluetooth headset – wearable, tied to a smartphone, but with screen and online access. Reflecting on the two, I think having Berg Cloud’s Little Printer as an early customer is more like when I was an early buyer of the original Apple iPhone in 2007. I remember one of my marketing students having one of the very first devices that July and showing it off in class. I got on board shortly after with the intent of leapfrogging from the laggard position in mobile phones I had found myself in. I remember attending an August conference and finding myself in discussions with several BlackBerry users who turned up their noses at iPhone and insisted they could never “downgrade” to one. But later that year, in December, I was at a niece’s wedding with lots of younger folks around, and during the various festivities, I spotted other iPhone users. They spotted me as well, giving me a subtle acknowledgement as motorcyclists still do today when passing on the road. It was the cool thing to be (an iPhone user, that is), and this was before there were even apps – imagine! So is Little Printer with its information services; upon installation, I immediately used my iPhone5 to sign up for its “new movies this week” and “Spanish word of the day”. My Google Glass experiences (chronicled in my own dedicated blog, "Glass Half Full") are more like true beta testing experiences. Google Glass is not a finished product, and though it certainly foreshadows great things to come in wearable computing, what eventually gets released to the general public will probably be much more refined. Similar to using Androids if you are accustomed to using iOS machines, it’s just a little creakier all the way around. But that is just my opinion at this point, and it is subject to change. Anyway, my experience with the Little Printer in just the short time I’ve been working with it confirms what I have been building on in past musings: It has captured the imagination of so many because of its solutionlike nature with respect to information and communication. 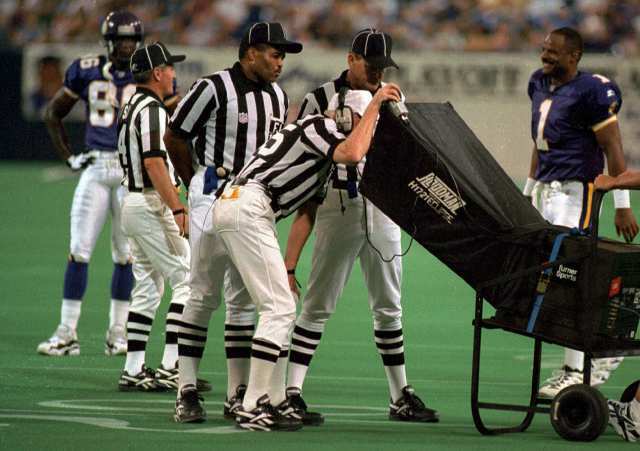 OK, I am getting ready for some football, thus the homage to instant replay in the headline (though must admit these reviews are NOT my favorite part of the games!). I reported in my HP "printer metrics" post last Thursday (see "HP Printing Results - Lots of black ink!") that for the reported hardware units/revenues, there was a surprising preponderance of positive results, comparing this year's third quarter to that of 2012. Here, obviously, multiple times each month - with my monthly Observations also appearing at The Imaging Channel as well as here, too. Another 1105 property, mine exclusively for mobile musings at The Imaging Channel, is "Goin' Mobile", and my posts appear with many others' work, as part of the "In the Flow" blog on the WorkflowOTG site. Last and most recent, I've begun posting about some of my Google Glass experiences, with an independent blog at "Glass Half Full" right here on Blogger. 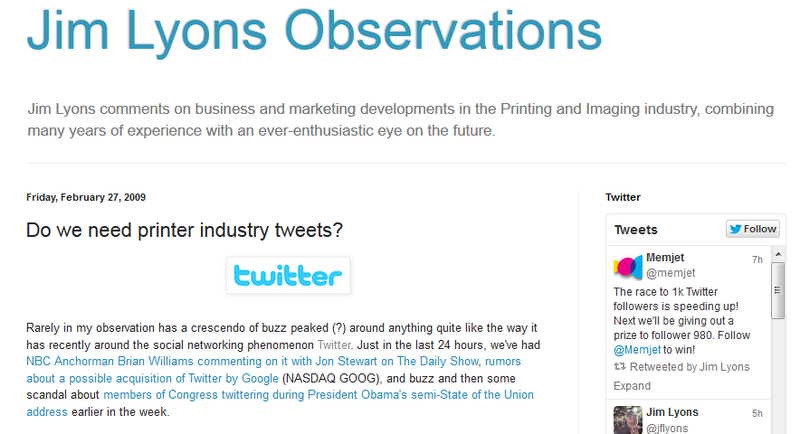 My tweets are still where they've always been @jflyons with the most recent scrolling on the upper right-hand side of this blog. Hope that getting this straight is helpful - it was for me! HP Printing Results - Lots of black ink! While HP stock was rocked in today's markets, based on a lowered 2014 outlook, the printing numbers for Q3 FY2013 were somewhat positive. In scanning the publicly disclosed details on the business (commercial printer units and revenues, consumer printer units and revenues, supplies revenues, and overall revenues and profits), the was more "black ink" in terms of year-to-year comparisons than we are accustomed to seeing. Those first four units/revenues categories? All up, though in the case of commercial hardware, only by the thinnest of margins ($1.399B in revs this year's Q3 versus $1.398B in revs for 2012 Q3). BUT, supplies revenues, roughly 2/3 of the total group's revenues, dropped below $4B for the first time since Q3FY09, and for only the second time since Q3FY06, representing a 4% decline. So what of the red ink in ink? It weighed heavily on the overall unit, which reported 4% declines in both revenues and profits as compared to Q3FY12. Just a quick post - I am delighted to be confirmed today as a speaker in the upcoming Business Imaging Expo coming up in December in Las Vegas! 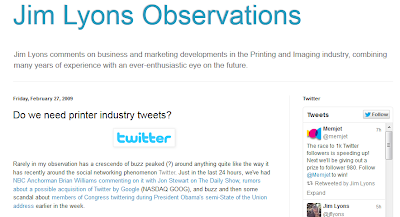 Printing and Imaging Tweets - we love 'em! As an active blogger for quite a few years now, I know how it can be somewhat painful to go back and read old posts. Sometimes they are naive, other times they include embarrassing writing glitches, and overall, truth be told, once in awhile, you just sound dumb! But the historic value cannot be denied, and most often I do relish the fact that I've logged my own thinking and observations from the time, as well as industry direction (including references). So case in point - here we are, about three-and-a-half years since I posed the question, "Do we need printer industry tweets?" and while my post from November 2009 includes ALL the aforementioned problems, I am picking it up again. And I plan to highlight some of those very best and active tweeters in our biz in coming weeks and months. To start, here's one with some stakes (i.e.prizes!). 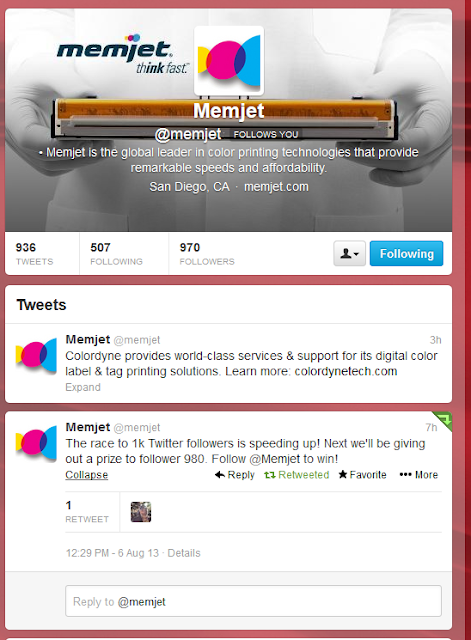 Memjet (see below) is racing towards 1,000 Twitter followers, and I am encouraging my readers to get in the game!